Bro. Eli Soriano, the Overall Servant of Members Church of God International (MCGI), called on the participants of the charity basketball league UNTV Cup to be relentless in doing good to all, especially those who are less fortunate and the charitable foundations being sponsored by the participating teams. The UNTV Cup Season 6 Finals was held at the Smart Araneta Coliseum on March 12, 2018. According to Bro. 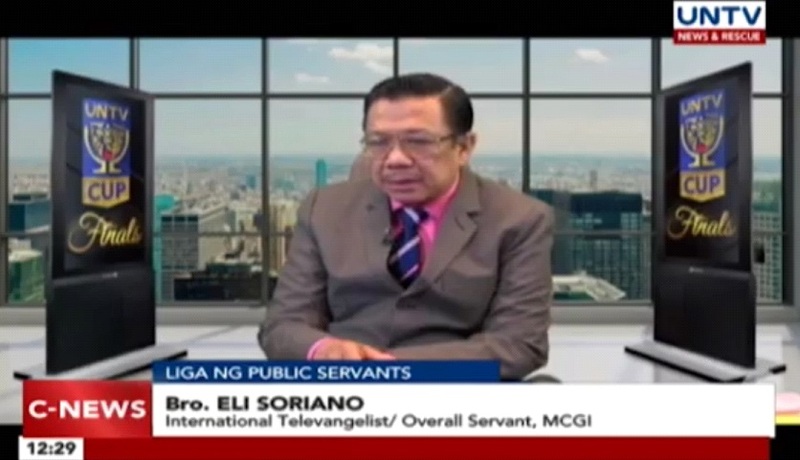 Eli, the charitable works conducted by MCGI and UNTV are continuous. He mentioned as example charitable efforts, “Libreng Sakay,” Medical Mission (which provides free medical services), and UNTV Cup. “If we are commanded to love our enemies, more so we should love those who are less fortunate and being sponsored by the teams through our basketball league,” he said. With the help of the teams that have participated in UNTV Cup, nearly P10,000,000 cash prize was given away to the chosen beneficiaries of the participating government agencies. Senate Defenders stopped Malacañang-PSC Kamao’s bid to win as the season’s grand champion during the Game 2 of the UNTV Cup Season 6 Finals. Whoever wins, however, would still bring the biggest joys to the big winners – their chosen charitable foundations. Season 6 champion, the Senate Defenders’ prize pot of Php4-million benefits Kythe Foundation, Inc., Tahanang Mapagpala Immaculada Concepcion, Inc., and Pangarap Foundation, Inc. The champion team received P500,000. Meanwhile, second-placer, Malacañang-PSC Kamao bagged Php2-million to help around 600 cancer patients of the Philippine Children’s Medical Center (PCMC) and Millennium Sports Support System Association, Inc. The team received P300,000. While the AFP Educational Benefit System Office (AFP-EBSO) received Php1-million from the AFP Cavaliers, the third-placer of the tournament. The team received P200,000. Fourth placer, the NHA Builders, planned to donate its Php500,000 prize to NHA Provident Fund Association, Inc. 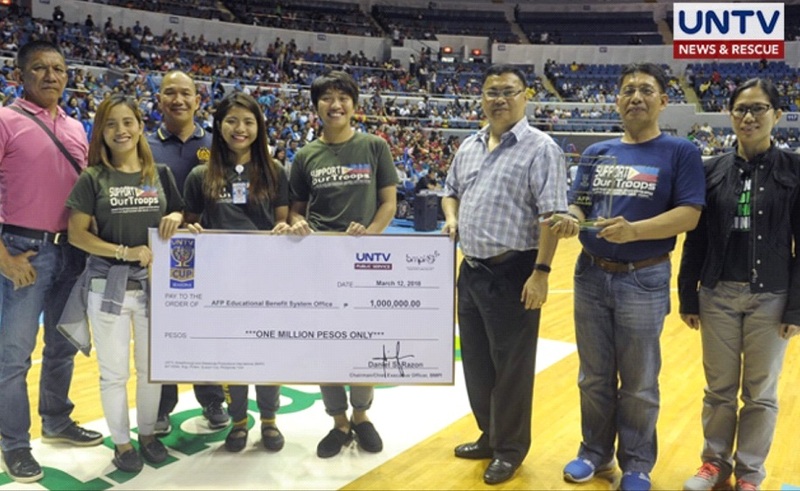 The team received P100,000 from UNTV Cup. PNP Responders — Php100,000 for Public Assistance for Rescue, Disaster and Support Services (PARDSS) Foundation International, Inc.
PDEA Drug Busters — Php100,000 for Confederation of Community Oriented Policing System NGOs, (CCOPS-NGOs) Inc.
BFP Firefighters — Php100,000 for Philippine Science High School Foundation Inc.
DOJ Justice Boosters — Php100,000 for Department of Justice Employees’ Association (DOJEA), Silong Tanglaw, Uswag Kabataan Inc., and Nazareth Home for Children Foundation, Inc.
COA Enablers — Php100,000 for Caritas Novaliches, Inc. Meanwhile, the Executive Face-Off of the UNTV Cup off-Season Games is eyeing a heightened up public service, and strong camaraderie between government officials and employees. “God-willing, it will be more exciting and more will participate,” added the veteran broadcast journalist and KBP Lifetime Achievement awardee.